I’ve read several end of year blog posts about ‘What I Learned This Year.’ I enjoy reading them as I’m interested in how others learn, and also find that it sparks ideas for my own development. When I sat down to write a similar post about what I learned in 2017 I made a list of areas I had developed in, and was surprised by how long it was. It’s been a year of rich learning, and I don’t have time right now to sit down and cover everything in a single post. Actually, given my list of projects and priorities, I’m not sure when I would make time for this. The second realisation I had was that in most instances my learning in different areas / topics is incomplete – it’s a work in progress. This makes sense as learning is continuous, and is part of being human. While you may protest that you know someone who never seems to learn, as humans we can’t not learn – just some people do it more consciously and effectively than others. The continuous nature of learning is why it’s important to reflect often, and one of the reasons that narrating your work and learning is so valuable. 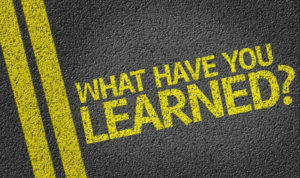 I learn quicker and better when I think about what I am doing and how I could do it better on a daily and/or weekly basis. Recording my narration in writing or on video (generally via Snapchat) leaves a trail that I can follow to see how I moved from one point to another, including all the meanderings, double-backs, side-tracks and dead ends along the way. By recording my narration I create a resource for further reflection and learning. This record helps to fill in the gaps and inaccuracies in my memory of what I did, how I did it and what the experience was like as I was doing it. It informs my future direction and next steps, as well as my learning methods. Where I choose to Work Out Loud and share some of this with others I have the opportunity to deepen my learning via feedback and discussion. There is also benefit in looking at my progress and patterns over a longer chunk of time. This helps to consolidate my learning and look ahead to how I can apply this and what I want to learn and create next. I find three months is long enough time to gain useful insight, particularly when combined with a quarterly planning cycle. The transition from one year to the next is a point where many of us slow down a little and is a natural point in the calendar to review and plan. This is why there are so many ‘what I learned last year’ and ‘my goals for the coming year’ style of blog and video posts. Instead of one long post to mark the passing of 2017 and arrival of 2018 I will do a series of shorter posts focussed on one specific topic per post. I may chunk it down even further and post about one aspect of what I’m learning about a topic…. Wait! I think I just said I’m going to Work Out Loud on an ongoing basis. This entry was posted on December 29, 2017, 2:12 pm and is filed under Michelle Works Out Loud, Reflection, Self-Directed Learning. You can follow any responses to this entry through RSS 2.0. You can leave a response, or trackback from your own site.